Magnificent Revolution run pedal powered cinema and music events. I have worked with them extensively, mainly on their electrical systems. They have a 8 and a 20-bike pedal power unit which can generate quite a bit of power (around 2kW with 20 riders). They wanted a display to give feedback on the amount of power being generated. It needed to have a large, highly visual display. A remote and wireless display was required as it would save running cables around the equipment. They asked RE-Innovation to build one. So here it is, along with a run through of the parts and how it all works. 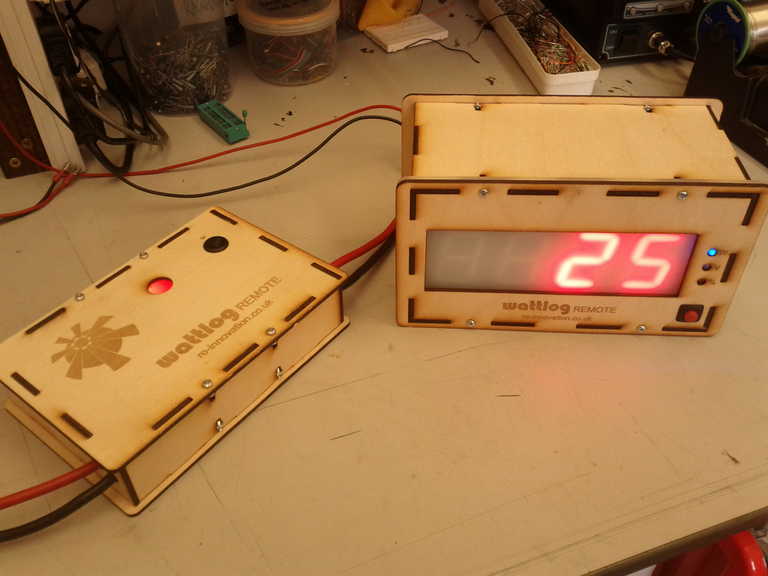 Here are the two units in action – the left hand side is the monitoring unit and the right hand side is the display unit. 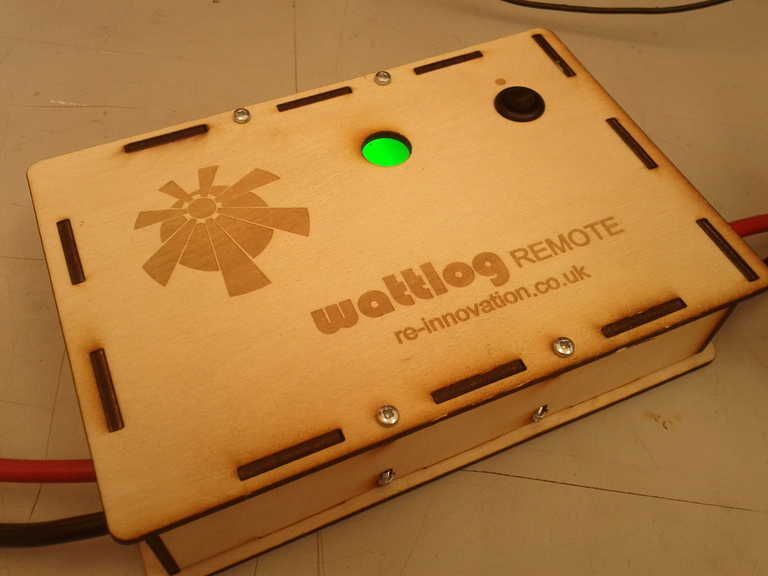 A monitoring unit which measures the current and transmits the data. 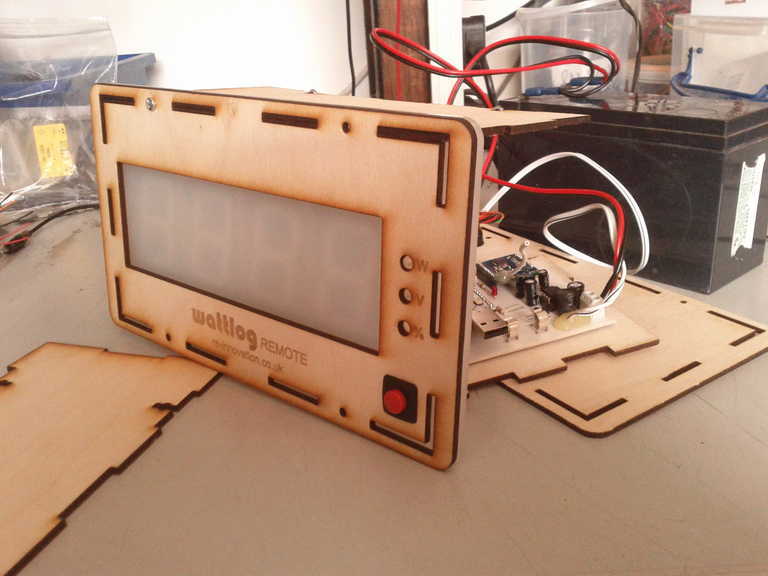 A receiving display unit with displays the information. 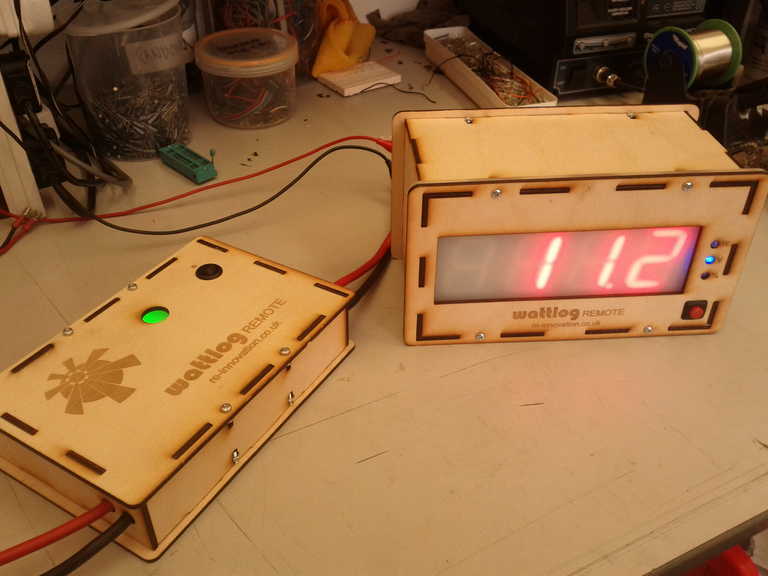 The LED shows different colours for different voltages. 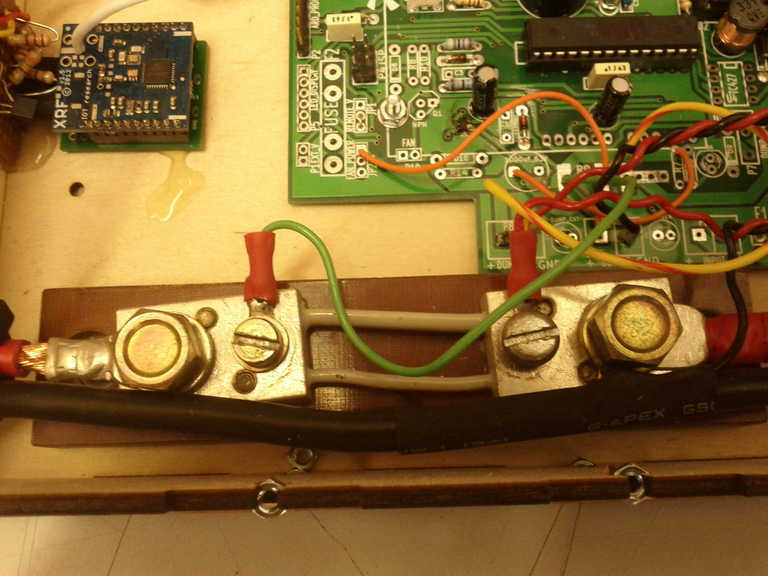 Between 11 and 14V it is green, as this is the correct operation region, below 11V the LED turns red which means ‘Pedal harder!’ and above 14V the colour is blue, which means people can slow down a bit. A small resistance is called a ‘shunt’ resistor. If we measure the voltage across it we can use the calculation V=IxR. More details on measuring current are available here. A microcontroller reads in the voltage and current and processes the data. This is based upon the ATmega 328 micrcontoller which has been programmed using the Arduino IDE. 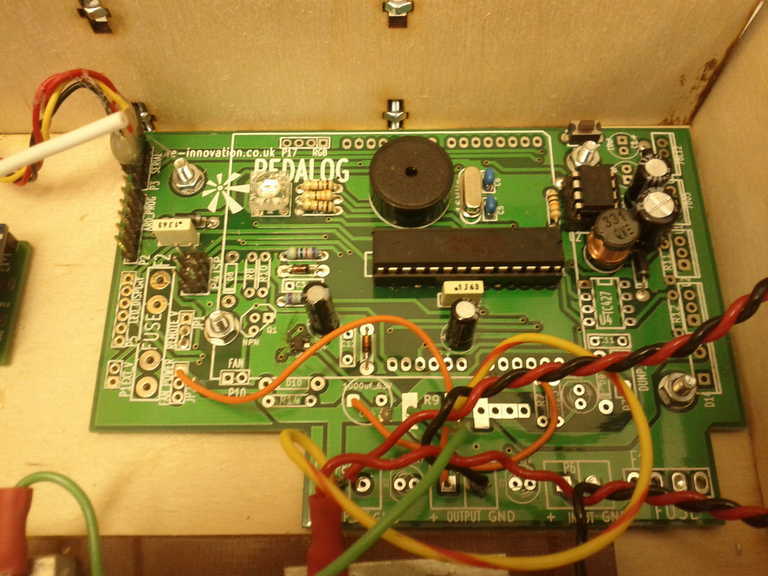 The circuit board is the Pedalog circuit board, but without any voltage control circuitry. 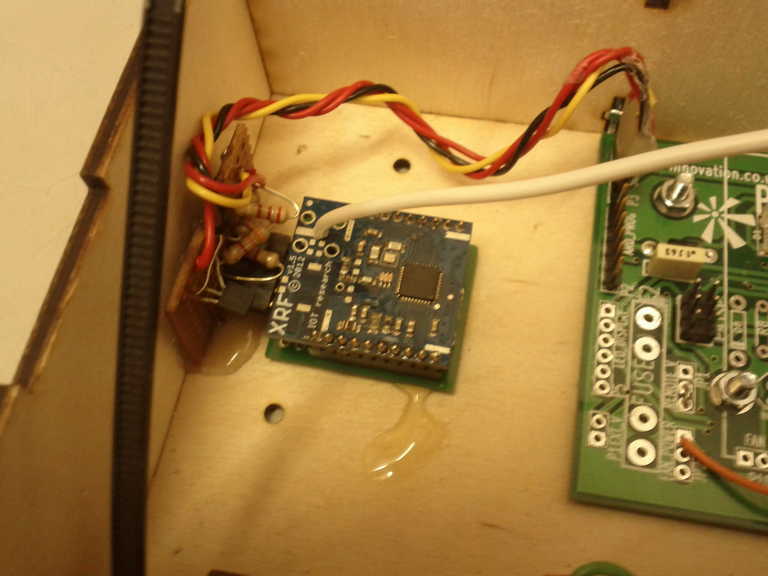 The data is streamed from the pedalog via the serial port. This runs at 115200 baud. 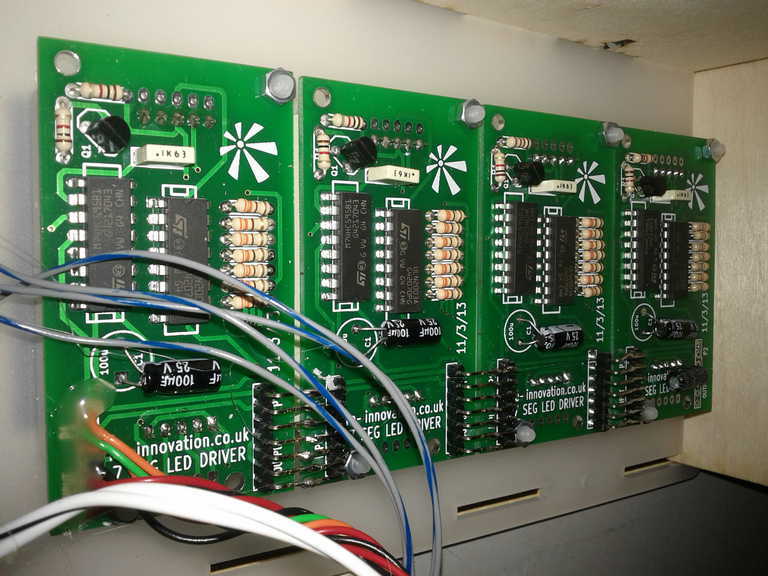 This data can be read by plugging in a serial port, or streamed wirelessly using an XRF module from CISECO. 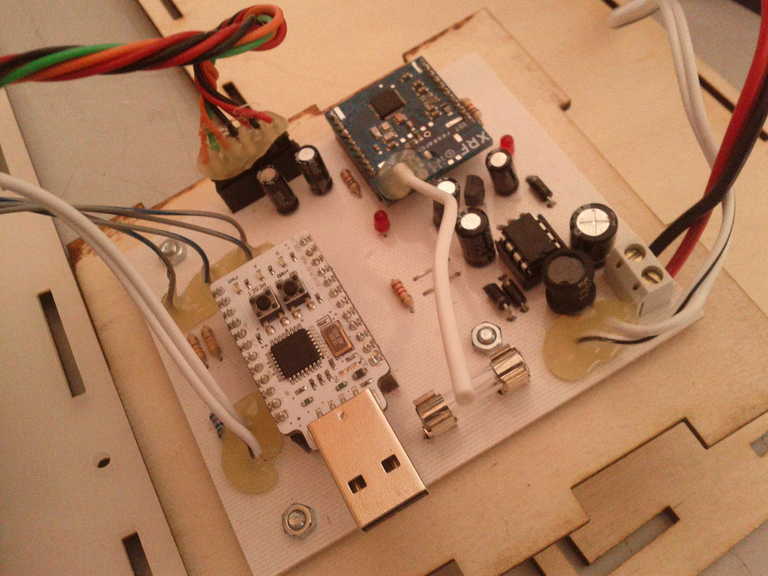 The XRF module sends data on the 800MHz radio frequency, similar to the Xigbee modules. This is the unit opened out. The front has a 3mm plastic diffuser. 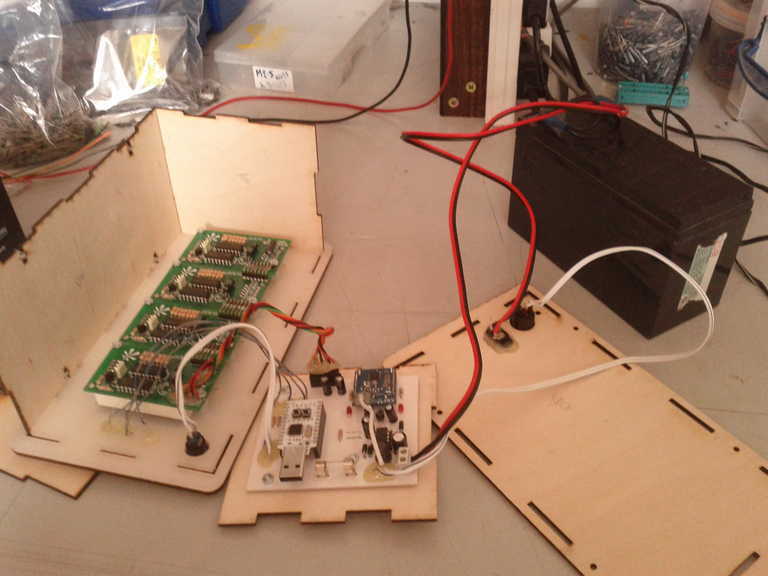 A home-made PCB holds the Minimus AVR, which is the mircocontroller, the DC/DC swicthing regulator and the XRF. 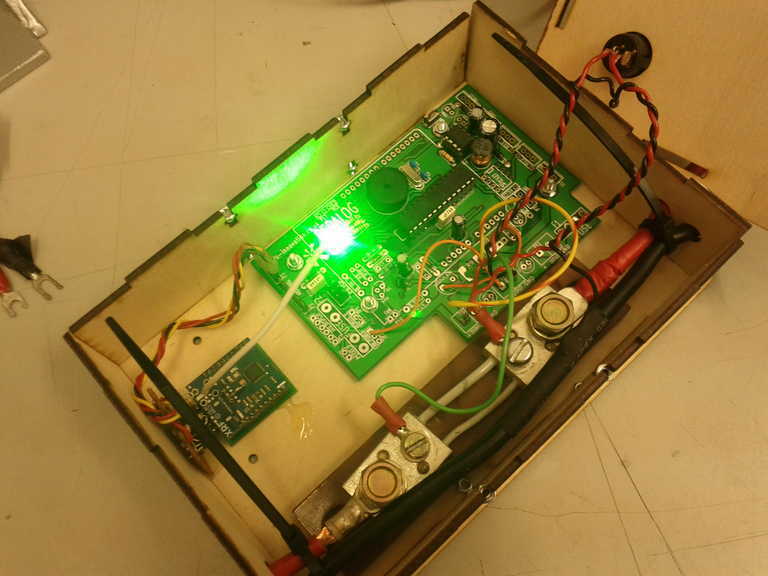 Please see my recent post on programming the minimus with the Arduino development enviornment. 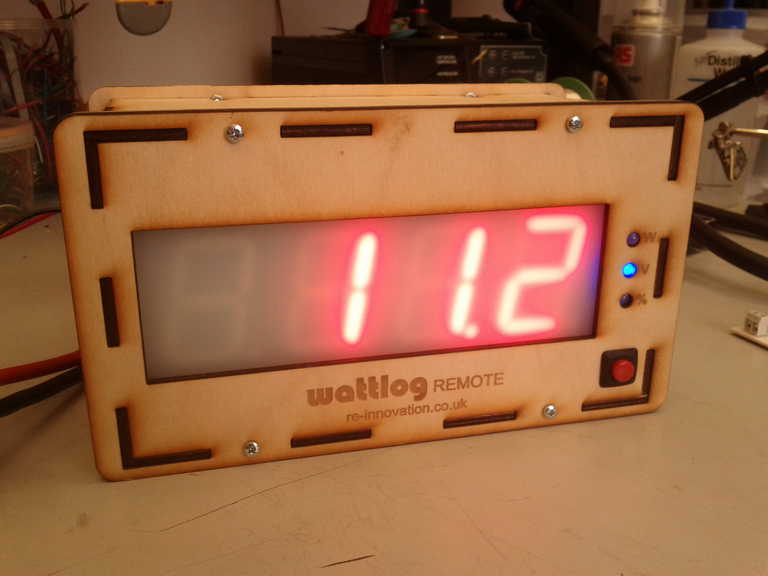 Here is a 4 digit 7 segment LED display (from our kit, available here). These are controlled by the Minimus AVR via a shift register. 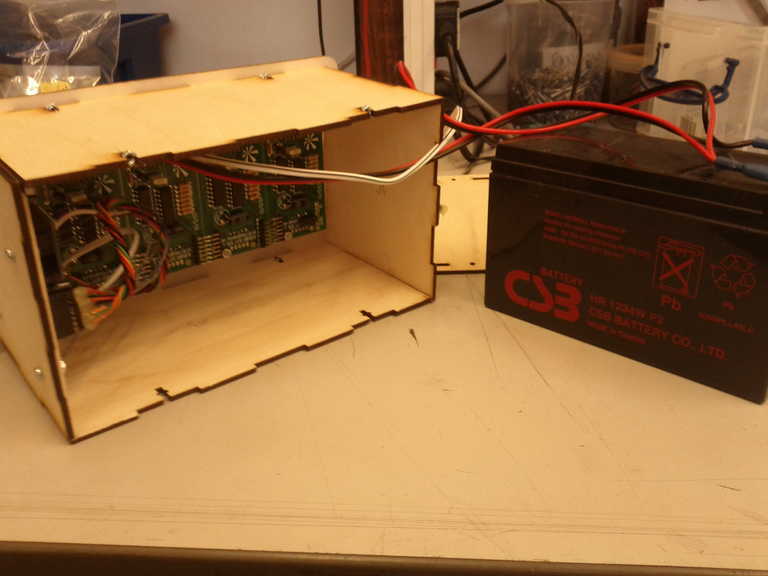 A 12V sealed lead-acid battery is the power source, recharged via a mains adaptor. 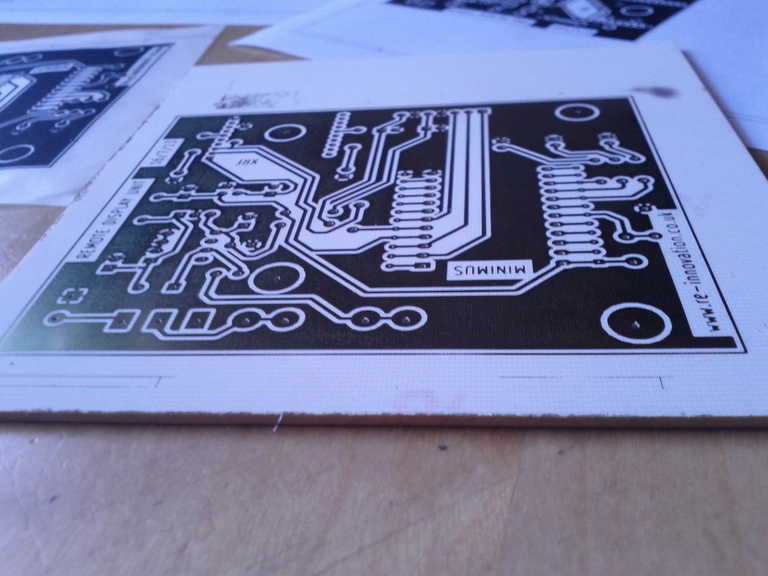 Here is the home-made circuit board. It will be used with Magnificent Revolution’s 20-bike pedal generator to show home much energy the crowd are generating. If you would like any more information or circuit details or if you are interested in a similar display unit then a then please get in touch.